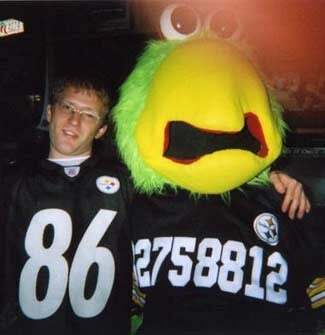 The young man in this picture, enjoying himself with the Pittsburgh Parrot, is Michael Tunison. He has two lives. 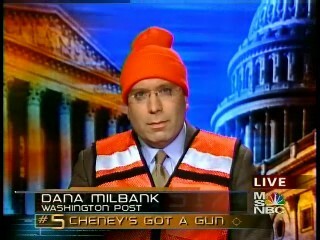 In one, he is Michael Tunison, reporter for The Washington Post. In the other, he is Christmas Ape, one of the crew at Kissing Suzy Kolber and a weekend editor at this here site. Earlier this week, these two worlds collided when Tunison shed his anonymity. In most cases, this turns out well for bloggers; heck, Jason McIntyre is getting freelance work now. It did not turn out well for Mr. Tunison. Once Tunison "came out," MediaBistroDC did a dopey, sniggering post about it — we are unfamiliar with those! — and, perhaps predictably or perhaps surprisingly, the Post freaked out. Less than 48 hours after Tunison's KSK post, he was fired. Upon sacking, I was told that I brought "discredit to the paper" with my choosing to drink at bars in my free time. Any good journo knows to keep the flask in the desk. Getting escorted out of the building by security was no fun, and sharing the elevator with Dana Milbank on the way out was even worse, but none of that compares with the withering scorn of Jean Grey. Thankfully, today, the name of The Washington Post is safe.